BBC NEWS | Africa | Can herbal medicine combat Aids? Can herbal medicine combat Aids? As a conference in Ghana asks whether traditional medicines could be used in fighting HIV/Aids, would you trust alternative remedies to combat a disease for which no cure has been found? Africa relies on herbalists and traditional healers for much of its primary health care. A recent World Health Organization (WHO) research revealed that the vast majority of medicines taken in developing countries are traditional medicines. In Ethiopia the figure is 90%. However the biggest problem is a lack of quality-control. The World Bank estimates that there are 25m Africans who have HIV and with rising cost of drugs and disputes between government and pharmaceutical companies, many are now seriously considering using traditional medicines. Could traditional medicine have a role to play in combating HIV/Aids in Africa? How can you tell if someone is a genuine expert in herbal medicine? 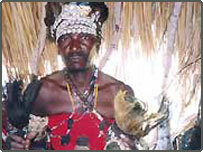 Have you been to a traditional healer? If traditional medicine men are capable of curing other diseases, why not Aids? It is a joke to dream that herbal medicine can combat aids. We will be living in a fool's paradise to give credit to herbal medicine. Wake up Africa and face the reality that science is the answer. There is no snake oil out there in herbalists' arsenals for this deadly disease. Conventional medicine hasn't yielded us with a cure for HIV - what is there to lose by trying traditional medicines - who knows there might even be a cure for this evil called HIV. I personally know of plants which are used to manage HIV infection. I also know some hospitals in Africa where herbal medicines are used in synergy with modern medicines (including ARVs) to treat HIV/Aids patients. I believe that traditional medicines have a say in the management of HIV infection. There is certainly a need to do some scientific investigations on traditional medicines. Traditional medicine is one of the new innovations in the field of medicine. I therefore have a strong belief that herbal medicine would definitely have a role to play in combating Aids but the problem is: will the herbal doctors be encouraged? If everything else fails so why not give herbal medicine a chance. I do not rule out the possibility of fighting Aids with herbal medicines. Most medicines are produced from herbs collected by pharmaceutical industry from different parts of the world. Traditional healers deserve due respect from the researchers. Indigenous knowledge is the untapped resources that the researchers should focus on first. With no checks and balances in herbal medicine, how do you tell which is a scam ? BBC, this question "Can herbal medicine combat Aids?" to me is a big joke. HIV death rate in Africa is growing at an alarming rate. If herbalists have power to cure people with HIV, why should they let the continent suffer? I have a number of old schoolmates who were affected by virus, their families took them away from town to villages thinking that traditional medicines would help them to survive but in vain. Would you trust the man in this picture to treat you for any disease - never mind HIV/Aids? Herbal medicine should be given a chance, otherwise we will never know if it has any use in fighting Aids. African governments should come up with proper guidance and monitoring of herbal remedies and their use in treating HIV/Aids. Perhaps the question should be framed more widely: "Can herbal medicines and nutrition combat Aids?" I would give it a resounding Yes. There are valid anti-viral herbs that can be given without the often serious side effects of anti-retrovirals. If nutrition is included, meaning proper nutritious food and well targeted supplements, I believe Aids could be overcome in a short time. Modern Pharmacists can trace their roots directly back to practitioners of what was then called 'herbal medicine'. Many of the compounds used in modern medicine are derived from natural sources. Who knows? Perhaps a long standing traditional treatment could bring a cure to the world. There is no harm in trying. Herbal medicine is also used in the Western world. I have three text books that document Western herbal medicine. More over, some Western medical products are made from herbs, trees or plants. I must say with personal experience that some African herbalists or native doctors as they are called in Nigeria, are superior to Western medical doctors in the field of orthopaedic medicine. The same faith I have for tablets or other drugs is almost the same I have for traditional medicine. The only difference is that the dosage of the latter cannot be quantitatively ascertained. You just need to believe in it and you see its magic. I strongly believe that herbal medicine can cure most of our diseases in Africa including HIV/Aids. The only problem is that it's often portrayed as something bad by the West, and the only reason being to discourage people in Africa from having faith in their medicine. Let's take China, as an example, most of their medicine is locally made, and they do not care whether the West likes it or not. So move on and help our suffering people. Research institutes will do well to incorporate studies on herbs. Some of these could be cures for diseases such as malaria and measles, which are being used in Africa with resounding success. Traditional healers should be made to go through a certification process while universities should collaborate with herbalists. Healthy competition would certainly reduce the cost of medical service. The end justifies the means. If African herbal healers can diagnose, treat and demystify dreaded diseases including HIV/Aids what a blessing that would be to the world. However African Herbal healers must separate their true mixtures, potions and concoctions that are medicinally potent from unnecessary rituals, animism and voodoo. I strongly believe that herbal medicine could help in combating HIV/Aids if they contain the right ingredients and proportions. Herbal medicines works just as others do if they are administered by a specialist. My grandmother used herbal medicines to help a lot of barren women who became mothers. I have faith in herbal and traditional medicines. Governments should set up a body to monitor how these herbalists administer their drugs and also, fish out the quacks. Although it is easy to dismiss herbal remedies as fallacies, there are cases where they have cured illnesses. If adequately regulated, these remedies could be of great help for people. The growing awareness of acupuncture and other herbal medicines in Europe and America is an indication that these remedies do have potency. While Aids it might be argued is in another league altogether. Africa has a lot to benefit from generational knowledge of herbal remedies.